Soup consisting mainly of fresh vegetables can generally be made in a short time. It won’t be as quick and easy as pouring boiling water into a cup of powder, but it will be much more nutritious and filling, and you’ll be avoiding all the additives. 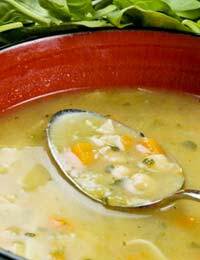 Whenever you make soup, try to have to hand either onions or leeks and some garlic which, as well as being flavoursome on their own, seem to intensify the taste of other vegetables. Broths and other soups made with pulses cannot be made in a hurry from scratch, but you can improvise with soup recipes using tinned versions of nutritious beans to get quick healthy soups packed with protein and fibre. It is alright to use stock cubes - there are good organic varieties available for a little extra cost. If you are keen, however, you could also set aside a day to brew up your own stocks using ham hocks, beef bones, chicken carcases and giblets, for example, with a mixture of root vegetables and herbs. They need to cook slowly over a period of hours. Once cooked and cooled, in order to keep it low calorie, strain the stock and skim off the fat. Stock can be frozen in portions as the base for many recipes and future pots of delicious soup, which then, of course, can be made very quickly. The low calorie recipes here are simple soups to make for you and the family on days when time is short. Most of us have made quick soups in minutes using frozen vegetables and flavourings and this tasty pea soup recipe is a great source of vitamins and fibre. Cook the onion in the butter or oil for a few minutes until softened. Add the stock and bring to the boil. Reduce to a simmer and add the frozen peas. Cook on a high heat for around 3 minutes. When the peas are soft, season the mixture with salt and pepper and liquidise to a smooth consistency. You can add a pinch of sugar before liquidising if liked, but peas are naturally sweet and you may want to check for taste. The soup is now ready, but for a creamier consistency you can add around 150 ml of single cream. To keep it low calorie, and add extra flavour, omit the cream and add some herbs such as fresh mint sprigs, while the onion is cooking. Remove the mint sprigs before adding the stock. This is a good recipe to get children eating vegetables they might not otherwise enjoy. The vegetables are quickly prepared - much quicker with practice - and, with the addition of crusty brown bread, a low calorie meal for the whole family is ready quite quickly. Heat oil in a large soup pot on a medium heat. Add leeks and saute for 3-5 minutes until softened. Add potatoes and broccoli and saute, stirring, for 2 minutes. Add the stock and bring to a simmer. Partially cover and simmer until all the vegetables are tender, about 15-20 minutes.Puree the soup in the pot with a hand blender, or in a food processor. Add salt and pepper and reheat if necessary before serving. If liked, this soup can be served with a light topping of low fat, plain yogurt, combined with a little grated parmesan cheese, white pepper and some chopped chives. This very low calorie soup takes only 10 minutes to prepare and 15 minutes to cook. Serve garnished with croutons. Put the carrot and onion in a pan with the mint, water and stock cubes. Bring to the boil. Reduce the heat, cover and simmer for 15 minutes until vegetables are tender. Puree the soup in a blender or food processor and return to the pan. Add orange juice and mushrooms. Add salt and pepper to taste and heat gently before serving with croutons. This recipe has only 90 calories per serving.